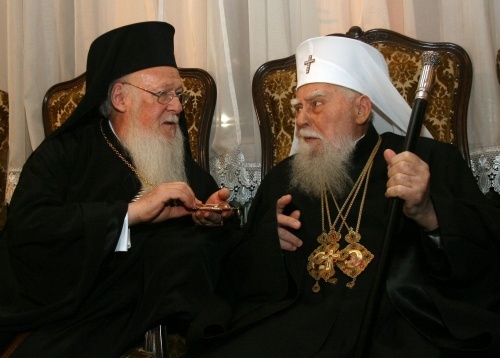 Ecumenical Patriarch Bartholomew I (L) during a prior meeting with Bulgarian Patriarch Maxim (R). Photo by BGNES. Ecumenical Patriarch and Archbishop of Constantinople Bartholomew I is on an official visit to Bulgaria this weekend to meet Bulgarian believers and official leaders. Bartholomew I arrived in Bulgarian city of Plovdiv to lead a special festive service Saturday morning on occasion of St. Marina's day, which gathered senior clergy from across the Orthodox world. Friday miracle-working icon of St. Marina arrived from the Holy Land in Plovdiv's metropolitan church bearing her name. Sunday morning the Ecumenical Patriarch met Plovdiv intellectuals and artists and learned about the history of the city. Bartholomew spoke of the Orthodox Church strong and historical commitment to the support of arts. In the afternoon Bartholomew I is on to Sofia, where he will meet Bulgarian President Georgi Parvanov and the Patriarch of the Bulgarian Orthodox Church Maxim. In May 2010 Novinite.com conducted an exclusive interview with the Ecumenical Patriarch on occasion of his prior visit to Bulgaria for the day of St. Cyril and St. Methodius.